Promoters of an AC/DC concert in Seville, Spain last year have been fined 15,000 euros (approx. US$16,000) over failure to supply refunds to fans who were disappointed that Brian Johnson was replaced by Axl Rose in the band’s lineup. The Guns N’ Roses frontman was brought in to take over Johnson’s duties after the singer was advised by doctors to cease live performances or risk permanent hearing loss. According to Spanish consumer rights agency FACUA, promoters Live Nation Spain initially provided refunds to fans upset with the change for the May 10, 2016, concert at Estadio Olímpico de Sevilla but shut down the offer after just three days when they became overwhelmed with requests. 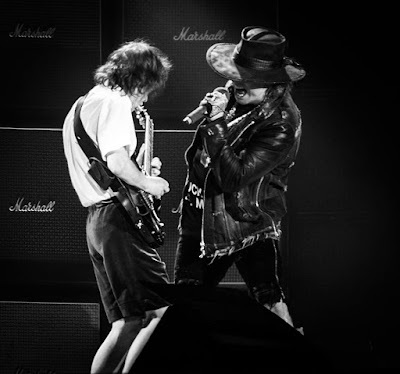 The Seville concert marked the second performance of Rose with AC/DC as part of the band’s European tour in support of “Rock Or Bust” – watch highlights from the show here. Following the spring 2016 European trek, Rose also joined AC/DC for a ten-date US tour last fall. A recent, unconfirmed report out of Australia suggests that the band are planning to work on a new studio album with Rose, who is currently on tour with Guns N’ Roses.